Hilarious Hollywood spoofs were a beloved feature on many classic Jack Benny radio shows. Regular cast members and guest stars alike were recruited to send up cinema classics like Casablanca, High Noon, and Sunset Boulevard. Celebrities could count on large laughs - and, looking good next to Jack's lovably vainglorious and miserly self - while poking fun at their most famous films. Even without guests, the movie mockery continued. Jack would simply announce a sketch and proclaim that he would be playing the lead! The rest of the cast, of course, was not to be out done - note Rochester's rendition of As Time Goes By and Mel Blanc's "Sleepy Mexican" routine. 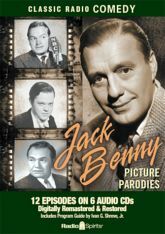 A treasure trove for both Benny-philes and film fans, this set includes 12 digitally restored and remastered episodes, performances by the likes of Bob Hope and Edward G. Robinson, and a Program Guide by Ivan G. Shreve, Jr.